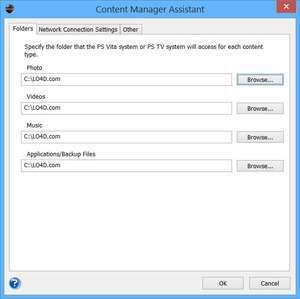 Content Manager Assistant for PlayStation is a tool which allows users to transfer files between a PS3, PS4 or PS Vita system directly from a Windows desktop PC. Once a system has been connected to a PC, the Content Manager Assistant will launch, giving you the ability to quickly manage multimedia files such as photos, videos, music and application backups. Since the program resides in the system tray, it can be easily accessed. The settings menu allows users to select which directories on the PC should be used to synchronize, download and upload files. Version 3.56.7933.1204 is a freeware program which does not have restrictions and it's free so it doesn't cost anything. For security reasons, you should also check out the Content Manager Assistant for PlayStation download at LO4D.com which includes virus and malware tests. Additional screenshots of this application download may be available, too.